This five-piece set’s got everything you need for near-endless masking. You've heard of clay. So what's slip, you ask? Used by ceramicists, it's a creamy blend of pigment, clay, and water used to decorate their wares. En Tsao's masks follow a similar formula, only they're here to perfect your face. Each set comes with three varieties of powdered clay: French rose (for dry skin), Moroccan red (great when you need a deep cleanse), and Dead Sea (a mineral-rich option that promotes vitality). Mix your favorite with a touch of water or the included activator, then apply. The result? A beautiful, fresher-faced you. 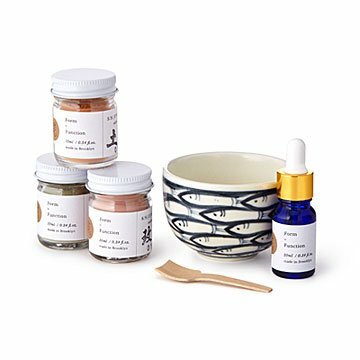 One set makes roughly 25 masks—that's a lot!—and comes with a hand-painted bowl for easy mixing. Handmade in New York and Vietnam. Born and raised in Singapore, Brooklyn-based maker En Tsao started her skincare journey in her college kitchen. Ten years (and more space) later, she’s still going strong, fusing her knowledge of Western herbs with her Eastern roots to craft vegan goods that soothe the skin and the soul. Her specialty? Clays—but she also likes plants. That might explain why she’s a practicing herbalist and enthusiastic forager, too.